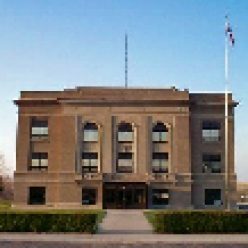 The Lyman County Courthouse is conveniently located at the south end of Main Street in Kennebec, South Dakota. Office hours are 8:00 a.m. to 12:00-noon, and 1:00 p.m. to 5:00 p.m., Monday through Friday. Our courthouse is spacious and equipped with an elevator so it is handicapped accessible. This web site tells about the offices located in the courthouse and the services provided by each office. Department Supervisors are listed and phone numbers for each office are shown.